Whether you are a seasoned scaffolder looking for a new set of wheels or a novice setting out on your own, a van for transportation of your scaffolding is an essential tool in your arsenal. 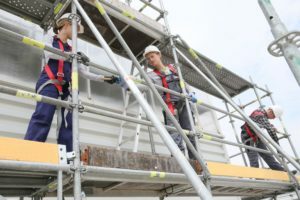 Regardless of how small or big a project is, scaffolders can mainly be found working from the back of their vehicles while loading or unloading materials. That is when they don’t have a cup of tea in hand! Since loading and unloading scaffolding from the van is part of their everyday job, working from vehicles is completely unavoidable. Materials need to be loaded and unloaded regularly from their vehicles so choosing the right van to make lifting equipment as easy as possible.